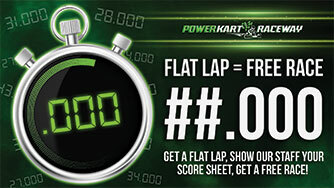 Get a flat lap (.000) at any time during a race and we will give you a free race for being so awesome! Make sure you check your score sheet at the end of every race and when you achieve a flat lap all you need to do is bring your score sheet to reception and we will award you a free race. 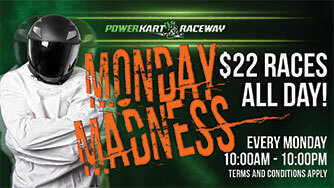 $22 RACES ALL DAY MONDAY! Monday Madness is a great way to start the week. Grab some mates and experience our awesome venue at a super discount! Conditions apply. WEDNESDAY NIGHTS 7.30PM-9.30PM: $70 UNLIMITED RACING! We have a deal that will get you excited about the middle of the week: Wednesday Nights, Two Hours of Power! 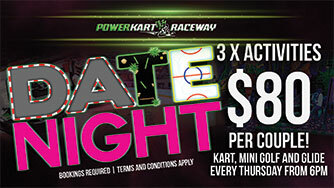 For $70 you can race continually for two hours (7.30pm-9.30pm). On the night 12 races will run, with 10 karts in each race. The session has a maximum of 40 racers. However, if there are less entrants there will be more available races e.g. if there are 10 entrants they will potentially get 12 races each, if there are 20 entrants, they will potentially get 6 races each. If the event is sold out (40 entrants), everyone will be guaranteed 3 races each. This event is recommended for racers who are familiar with our track and karts, as it is expected to be 'fast paced' racing all evening. To reserve your spot call 02 6239 5599 and pay over the phone or come in and pay over the counter. If you pay in advance please ensure that you arrive at 7.00pm. 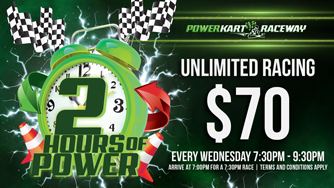 Make sure you come down to Power Kart Raceway and take advantage of this great deal! Conditions apply. There will be no arrive and drive spots available during 'Two Hours of Power'. Kart, Mini Golf and Glide for $80 (saving $36) Every Thursday Night between 6pm and 10pm. 2 People x 3 Activities = $80. Please note 8:30pm is the lastest time slot to accommodate all 3 activities. To reserve your spot call 02 6239 5599 and pay over the phone or come in and pay over the counter. Conditions apply. 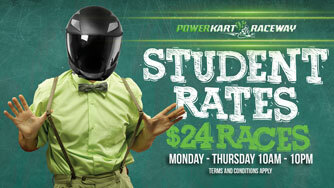 $24 races for students, Monday to Thursday 10am - 8pm. Looking for an after school activity that's fun, great for developing coordination and can be done with a group of friends. Our Student Deal is perfect. General: Offers are not available on Public or School Holidays (ACT & NSW) and cannot be used with any other offers, vouchers or deals. Races are not transferable between members and discounted races must be used on the day of purchase. Deals do not include Annual PKR licence. Students Deal: Driver must present their current Student Card to redeem deal. To be eligible you must to be a current full-time student. The Student Deal is only available on Wednesday night until 7.30pm due to Two Hours of Power. Two Hours of Power: This deal is not available to Annual Pass holders.